With the help of other pilgrims, volunteers and locals, Patrick and Justin reach O Cebreiro: a physical but also emotional high on their Camino de Santiago journey. Next stop… Santiago de Compostela! and a bittersweet feeling as their amazing challenge is nearing its end. There’s no other place I’d rather be than right here, right now. 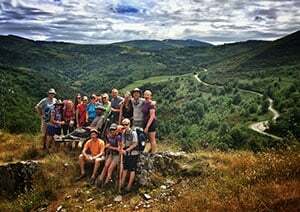 I just spent the last 10 hours with 16 wonderful volunteers who decided to spend their sunny day pushing me, pulling me, and even carrying me up a steep rocky ascent into O Cebreiro, a picturesque mountaintop town overlooking the Leon and the Galician valleys. In our final 1 km, we were escorted by a local volunteer group who, with their truck and lights ablaze, ushered us into town with the locals looking onwards. The view is absolutely spectacular and we all shouted with abundant cheer as we reached the top. I’m literally on a high. Both emotionally and physically. These are the types of encounters that one who goes on the Camino gets to experience. Our journey will soon come to an end. While sad, it also leaves me with a sense of great accomplishment…something I can be proud of. As I look down onto the valley that will be taking Patrick and I into Santiago, I can’t help but wonder what lies ahead, but also am amazed at the markers/milestones that lie behind us. We have now traveled over 600 km and can see that we are on the homestretch. There’s a major part of the journey that we do not want to end. 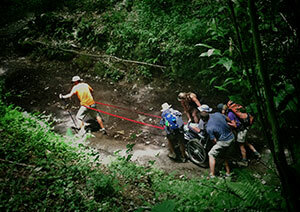 The camaraderie, the friendships, cafe con leches, cyclists screaming “BUEN CAMINO!” (aka… Get out of the way! ), nightly chats and communal meals with people from all around the world. But yet, we have the sense of urgency to return home. To attend to our families, love and appreciate them to the end of our days. And get back to work in some strange, weird way. I think it’s because we don’t really want it to end but we do at the same time. We want to continue the sense of the Camino, the almost magical spirit that flows within it. A path where people come together, find common ground and experience an intimate community. Our sense of urgency to get home is strong, a yearning and deep desire to return to our loved ones who we miss deeply. I’m not sure. 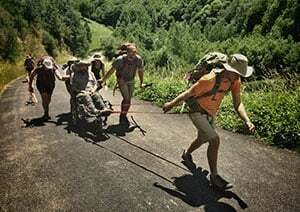 We will continue onto Santiago, doing our best to arrive as planned, knowing that we have accomplished the insane goal of walking/rolling 800 km from St. Jean to Santiago. But we don’t want to leave our friends and travel companions behind. We want to continue this journey that we started together, sitting down enjoying our time reminiscing about the struggles of the day, the struggles of our lives, and what we want to get out of life. It’s a contradiction. It’s a zeal for wanting to be better, so much of which is accomplished through spending time with other human beings. No matter where they come from, no matter what language they speak, no matter what struggles they have, or their background. We want the best for everyone we come in contact with and the best for ourselves as well. But I know more is waiting for us in Santiago…. I am sitting here trying to think what to say after reading your amazing post with tears in my eyes. I totally understand what you say about not wanting the walk to end as I also felt the same way. Ever since I finished the El Camino and returned home I have totally missed it and want to go back and do it all over again. My husband continues to ask me why I miss is it so much and I find it very hard to explain to him why. It was such an amazing experience that I will never forget that not only included wonderful sites and amazing people I met on the trail but the idea that I did it! Absolutely wonderful. God is great. Someday I would love to do the walk. Enjoy your last moments which I am sure you will remember forever. There are tears in my eyes as I read all of your posts, one by one. You two, your deep friendship, your trust, your courage and the kindnesses of those fellow pilgrims you’ve met along the 600 kms will resound in my heart for a long time. I think you are giving a huge present to the world. Surely, your families will be changed in ways that you cannot expect. And so will your readers. I felt a similar call to pilgrimage back in 1983. With a small group, I walked across 1500 U.S.miles in opposition to nuclear weapons. When I heard of Plowshares Pilgrimage I couldn’t explain the draw I felt to become part of it…. This may happen to you, but you will get through it. And your lives will have been enormously broadened by the sacred experience of following the Camino. I have been very blessed by your story. Way to go ! Be proud of yourselves. Now go home and hug your family. The true gift. Bless you both. I met you in a hard uphill betweeen Leon and Puente y Hospital de Orbigo. We helped to push you along with my husband. And I am so happy to have met you and now to find put your wonderful story. Have a safe trip back home !